Cook lasagne noodles according to package directions. Heat oil in large skillet. Add mushrooms and cook, stirring, until golden brown. Add parsley and cook for 1 minute. Add artichoke hearts; season with salt and pepper. Set aside. Preheat oven to 180° C (350°F). Spread 1 cup (250 mL) tomato sauce in bottom of a 13 x 9 x 2 inch (33 x 23 x 5 cm) baking pan. 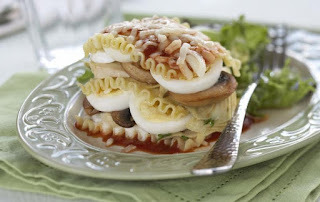 Arrange 3 lasagne noodles, side by side, over tomato sauce. Top with half of the artichoke and mushroom mixture. Layer half of the egg slices over the top. Sprinkle with 1 cup (250 mL) mozzarella cheese and one third of the parmesan cheese. Repeat layers beginning with tomato sauce and finishing with parmesan cheese. Top with three remaining noodles. Spread with remaining tomato sauce and sprinkle with remaining mozzarella and parmesan cheese. Bake until cheese is melted and bubbly, about 30 minutes. Let stand for 10 minutes before serving.